As I navigated my son through the Saturday shoppers on Kensington High Street, I cursed the impending downpour. As we neared Kensington Gardens I could hear collective murmurs rising above the noise of traffic, then I began seeing placards and chequered scarves; another protest outside the Israeli embassy, a regular occurrence in the Royal Borough and one I have witnessed on many occasion in my 30 something years as a resident. As we crossed the road to avoid the protest, I caught my son’s little face looking up to me for reassurance, his wispy hair blowing in the wind. I scooped him up and patted him on the back. Passing the barricade of police officers, my son innocently gawked at the protestors across the road, mouth wide open in amazement. To a toddler, the ruckus must have seemed terrifying. I too stopped, trying to capture the gist of what this latest protest was about; sure I keep up to date with current affairs and had some idea, but I didn’t know that by simply observing this time round would have such an emotionally profound effect. A group of Orthodox Jewish men stood on the front line of the protest, participants I really didn’t expect to see. Proudly holding placards and Palestinian flags, they politely refrained from hollering. 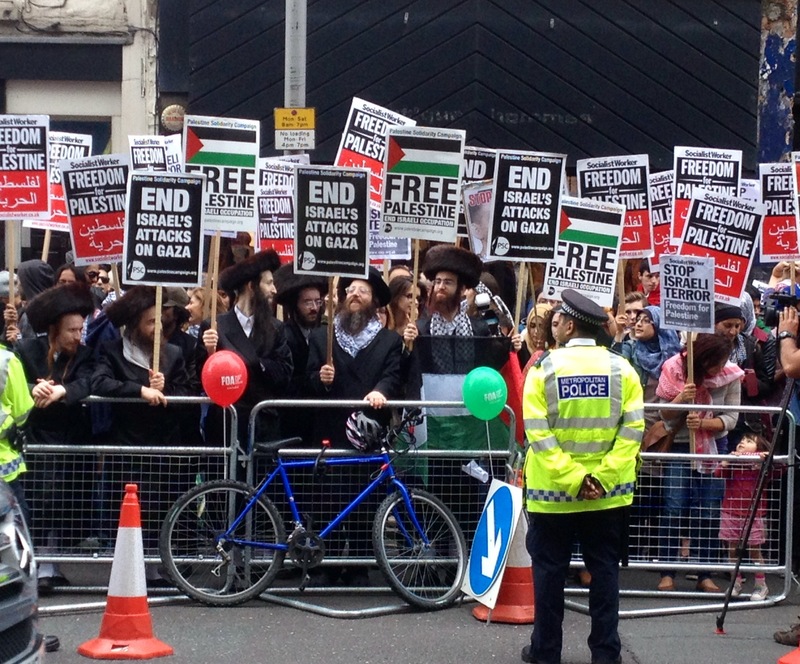 Seemingly at ease, they appeared fearless in the face of what potentially could be perceived to the ignorant eye such as mine, not only an anti-Israeli rally, but an anti-Semitic one too. I took a photo of the group and tweeted it assuming that it would be lost amongst the social media giants. Little did I know that within hours my photo would become viral; retweeted, shared and liked hundreds, then thousands, then tens of thousands of times all over Twitter, Facebook and Instagram. ‘Who is responsible for this?’ Bombarded by hateful captions and comments, the finger of blame is pointed this way and that. Entire creeds and faiths are vilified and perceptions are embedded into the psyches of those seeking answers. Hate is voiced and in other cases retaliation is actively sought. Yet it is massively important not to tar everybody with the same brush for regular civilians cannot control the actions of their own government. For the average person such as myself, I cannot fully understand the horror that enrobes the people of the region. For me, hardships were few and fixable. There was always hope. It’s easier to bury my head in the sand and believe it doesn’t affect me. So why then was a lump forming in my throat? Why was this protest having an impact? We had only gone out to feed the ducks! I look at my son who is still engrossed by the protest; I care because of him. I care that he should know compassion and injustice. I care that my son is accepting and shouldn’t dwell on differences spurred on by an age of rage riddled social media. I care for the sake of humanity and all the sons and daughters who are suffering. I care because I am human; I cannot see would be refugees with nowhere to turn, barricaded by land and sea. Nor innocent men women and children at best impoverished, at worse wrapped in shrouds, victims to a sky which rains bombs and bullets. The protest was an emotionally charged collective voice with an urgent message. There is a terrible thing happening at this moment; the heart of the Mediterranean is bleeding. There are lives being needlessly spent in a crisis of humanity, one we all can no longer ignore. I saw them standing shoulder to shoulder in Kensington, Muslim, Jew and Christian and I was deeply moved, not as an activist, but as a mere observer. For hours after the protest, I received messages from friends telling me that my photo had been shared by various people, some very well well-known. Some speculated it to be a fake, others were crying out for the rest of the world to see it. Why was one photo so massively relevant? Because it shows that humanity dwells in the heart of everyone, regardless of religion and race. People have had enough of an eye for an eye. With an eye for an eye everyone went blind. We may not have the immediate solution for the peaceful co-existence of Israelis and Palestinians, or for chipping away layers of hate stretching back for generations, but if we begin to stand together there is at least some hope for humanity. One week on and there is another protest outside the Israeli embassy with supporters numbering near thousands. A helicopter circles the area and the press is out in force. An iconic London double decker is at a standstill just metres from Kensington Palace and protesters climb aboard and out onto its roof, waving Palestinian flags victoriously. One determined reporter is pushing through the crowd, I see his eyes fixed on the bus and sure enough within minutes he is balancing precariously on its roof. There is a huge roar from the crowd as an Orthodox Jew, rumoured to be a Rabbi, also climbs on top, placard in hand. The collective voice is gaining strength and they’re begging the world to listen. This entry was posted in Uncategorized and tagged Gaza, Israel, London, Palestine, politics by reikiandrocks. Bookmark the permalink.